One of the greatest catch-phrases of the 20th century was “Where were you when JFK was killed?”, which was not to be surpassed until the death of Diana, Princess of Wales, when a similar question was asked – “Where were you when you heard that Diana had died?” However, 50 years ago, back on November 22nd, 1963 when U.S. President John Fitzgerald Kennedy was shot dead, no one would have forecast that on the following day, 50 years on, that devotees the world over would be acknowledging another phenomenon. November 23rd, 1963 was the first telecast of British BBC science fiction TV series – Doctor Who. Folkloric legend states that the showing of the first episode was delayed by 10 minutes in transmission due to the extended world news coverage of President Kennedy’s assassination. Since then there is anecdotal evidence that indicates that the transmission delay was only around 2 minutes. So, who was Doctor Who? He was a time lord who travelled and explored the universe in his TARDIS (Time Relative Dimension in Space) spaceship which was based on the real design of 1960s British Police box. Since its first series transmission in 1963, there have been 11 Doctors, and this anniversary introduces its 12th Doctor to be portrayed by actor Peter Capaldi. My favourite characters were the Daleks, who first appeared in the series in the early ’60s. They were ‘Kaleds’ who were from the planet Skaro and lived inside tank-like mechanical rolling armoured robots. Their catch-cry used to aid the killing of all non-Dalek beings was – “EXTERMINATE”, uttered in a semi-broken computer staccato sound. For me, the music is one of the greatest and weirdest tracks ever written. The original score is by Ron Grainer. If you want to hear it, please click on this YouTube link. The image above is a copy of a Dalek stencilled by New Zealand stencil artist HaHa aka Regan Tamanui. For further examples of Street Artist work see my Street Artist A-Z Listing. 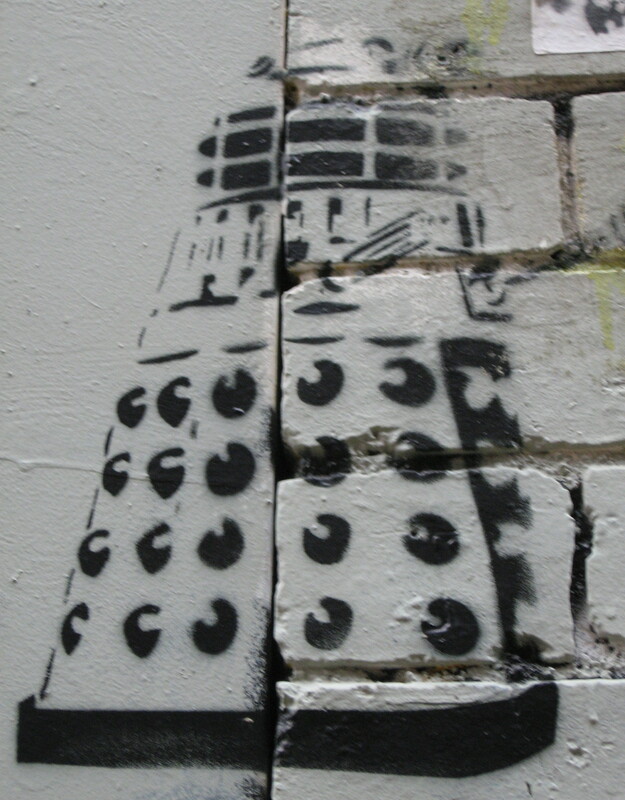 This entry was posted in Stencils, StreetArt and tagged Daleks, Doctor Who, Dr. Who, Ha-Ha, Regan Tamanui. Bookmark the permalink.